Laughable AGU Claim: 2011 Tōhoku earthquake and tsunami 'spurred global warming' | Watts Up With That? Plotting that 6,600 metric tons they say was released by the Japan Earthquake/Tsunami against U.S. emissions, by adding it to this chart from the EPA, we see the reason why – the amount is miniscule in comparison. Note that the value cited in the PR (6,600) is in tons, not million metric tons, which is what this EPA graph represents. Compared to world emissions, the 2011 event wouldn’t be much at all, and this is why there’s no uptick in 2011 in global atmospheric concentration; the event is likely below the threshold of the measurement, and/or not all those refrigerators vented like they thought. Although the global effect of one event is small — emissions associated with the Tohoku earthquake accounted for 4 percent or less of global emissions in 2011 — the cumulative effect could be larger, he said. Of course, that doesn’t stop them from making exaggerated claims in headlines that will be gobbled up by reporters with no comprehension of scale. It’s all about grabbing headlines these days, as the recent bad science from Michael Mann demonstrated so well, because it is unsupportable. WASHINGTON, D.C. – Buildings destroyed by the 2011 Tohoku earthquake released thousands of tons of climate-warming and ozone-depleting chemicals into the atmosphere, according to a new study. Halocarbons released as a result of the earthquake include chemicals that deplete the ozone layer and contribute to global warming – including some gases that are no longer used because of those harmful effects on the environment. These include chlorofluorocarbons like CFC-11, a powerful ozone-depleting chemical used in foam insulation until it was phased out in 1996, and hydrochlorofluorocarbons like HCFC-22, an ozone-depleting refrigerant that is also a powerful greenhouse gas and is in the process of being phased out of use. Among other halocarbons released by the earthquake were hydrofluorocarbons, or HFCs, and sulfur hexafluoride, both potent greenhouse gases. The emissions of the six halocarbons released from Japan in 2011 are equivalent to the discharge of 1,300 metric tons (1,433 U.S. tons) of CFC-11 alone — equal to the amount of CFC-11s found in 2.9 million refrigerators manufactured before the chemical was banned. The total emissions of the six chemicals are also equivalent to the release of 19.2 million metric tons (21.2 million U.S. tons) of carbon dioxide into the atmosphere – an amount equal to about 10 percent of Japanese vehicle emissions in 2011, according to the study’s authors. The new study also calculates the total impact of the increased emissions on ozone depletion and global warming. The earthquake-triggered surge of halocarbons increased ozone loss from Japanese emissions of those six gases by 38 percent* from March 2011 to February 2012 compared to the same time period in the years before and after the event. The amount of heat trapped in the atmosphere because of Japan’s emissions of those six gases rose 36 percent from March 2011 to February 2012 compared to earlier and later years because of the extra emissions from the earthquake, according to the new study. National halocarbon emissions estimates by the Japanese government did not factor in the release of the chemicals due to the earthquake and are likely underestimating the amount of these substances in the atmosphere, according to Saito. Governments rely on inventories of chemicals and generic data about how they are used to estimate their amounts in the atmosphere – called a “bottom-up” approach” — whereas the new study uses actual measurements of the gases – called a “top-down” approach. “It is apparent that there are unreported emissions,” Saito said. *Note: This value has been corrected from the accepted manuscript posted online. March 26, 2015 in Alarmism, CFC's, Ozone. You can’t be too careful though. We should outlaw earthquakes. Be a win-win if we just taxed ’em, surely. Just make sure that pollutants are released – ONLY – in pats per trillion, per the graphs. Is that cow pats / million. That’ll great a stink. No no! Not outlawed – we must TAX the earthquakes. And to make sure tax revenue flows in, tax also the prospect of earthquake – just in case. Pope Pius XII excommunicated all Italians who vote for communists to save Italy for the establishment, so why can’t the modern-day Pope excommunicate all Catholics who breathe out more than they breathe in? It’s the out-breath that releases CO2, not the in-breath. It’s about time the planet was saved from those dirty Out-breathers! start with one group of people and spread the new planet-saving regime! Another plus would be politicians [and alarmists] who spoke less would be showing their genuine commitment to saving the planet! Did that researcher did anywhere near the FUKI reactors? Those there are Yankee tons, equivalent to 232,800,000 Yankee oz. “Ton and metric ton are weight measure units. However, there is a difference. Metric ton is equal to 1000 kilograms and is SI unit. Hence, it is a megagram as it contains 1 million grams. The term ton is comes from Latin word tunna which means cask and in the past a cask filled with things usually weighed almost a metric ton. Exactly so. Just for interest the ;long ton; is the original British ton which at 1016kG is closer to the metric ton. But would a ton of any description weigh less at the equator because the of the greater centrifugal force working against gravity? Is that a ton equivalent to a ton of sheet? 1. China would be the country to finger, here… . Are you suggesting the greenhouse effect is not real? It most certainly is… Even the notorious mr watts knows that. That’s what’s up. Everything causes global warming and global warming causes everything (bad)! It’s a problem in search of a solution and a solution in search of a problem! It’s a cost center and a profit center! Now Climate Change is causing long term catastrophic variation to beer taste!! Me too. For some reason I reversed the cause and effect in the blog post title. I thought it was coming back to something from a few years ago claiming the force exerted by typhoons downward via storm surge on the seafloor could trigger earthquakes and global warming IF it was found to produce increased cyclonic storms COULD, POSSIBLY, MAYBE with a 97% confidence level trigger more earthquakes & tsunamis IF that effect were true. As a comparison, equatorial volcanic eruptions can, if explosive enough, cause robust, season-dependent distinctive weather patterns across Europe. Compare that observed and modeled phenomenon to the present study and one might determine the voracity of this earthquake-linked claim. So you have a voracity for veracity?? The way the AGU behaved over Mr Fraud , showed very clearly how in future its views should be consider. That its own honoured son should act in the way he did but still cause this organisation no concern , indeed he remains an honoured son, show they have no concern with to the need for honesty or for doing good science. Anthony: You’ve failed to convert the 6,600 metric tons of emissions into CO2 equivalents. The press release does this for you. It says these 6,600 metric tons translate into 19.2 million metric tons CO2 equivalent (the IPCC assigns these gases very high global warming potentials). That’s roughly the same amount of CO2 about a half dozen coal plants would emit in a year. So the amount released during the earthquake is, on a CO2 equivalent basis, quite a bit larger than you suggest, but it is still very small in the grand scheme of things. 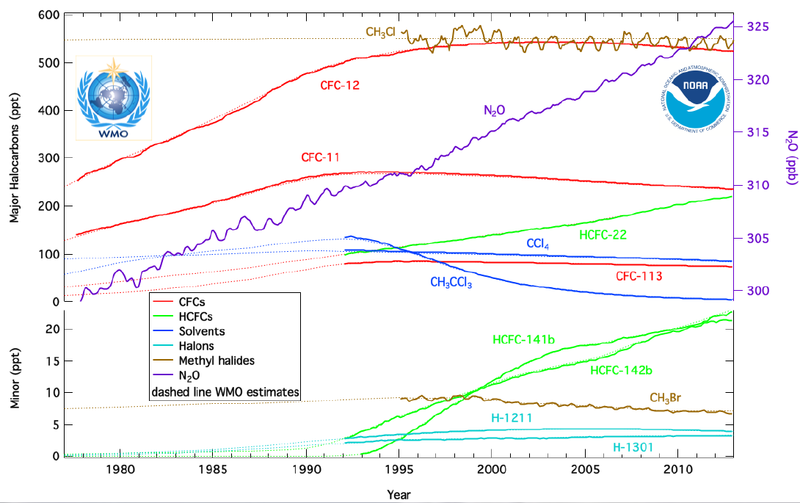 First, this plot from NOAA and endorsed by the World Meteorological Organization (WMO) shows no uptick in CFC gases in 2011, suggesting that the effect of the Earthquake and Tsunami had no measurable global effect in atmospheric concentrations in 2011 or years afterwards through 2013. Water vapour. The most abundant greenhouse gas (GHG), however because it spends just a short time in the atmosphere, and humans have a very impact on the amount of water in the atmosphere, it is not considered the most important GHG. Not so sure about the rest of it though. @ Saint…in the last 18 years atmospheric co2 has increased around 36 ppm, which equals 30% of the 120 ppm increase since the late 1700s. If the Tohoku Quake could cause a change that science was able to detect due to this tiny release, wouldn’t you think that science could detect the affect on the climate system from this enormous record setting addition of co2 over the last 18 years? There seems to be a meme developing where Carbon[Anything] is bad for CAGW. So chloromethane is now “halocarbon”. Since when, precisely? Speaking as a graduate chemist, I have to say “WTF?”. When will it be deemed that HydroxyCarbon (formerly known as ethanol a.k.a. ethyl alcohol) is bad for the environment? Already happened . The US banned it for, what ,13 ? years , and unleashed a decade of crime and corruption on a scale not seen before or since. And now they subsidize its production from corn to fuel our cars. There’s probably some corruption behind that too. Admad, please get with the programme. In descending order of concentration, the atmosphere now comprises of Hydro-CARBON-ogen, Ox-CARBON-ygen, Argo-CARB-on, Carbon Di-CARBON-CARBON bloody CARBON dioxide, etc, etc. (sarc/). I see a Monty Python ‘spam’ song coming on here . . . .
Just be glad we’re not silicon-based life forms they could tax every rock and pebble as evil silicates. I am more worried about the radio-isotopes leaking from the Fukashima plant than a relatively small amount of inert gasses. Billions of Becquerels of bio accumulating iodine-131, cesium-134. J, You’ve been sold a pup. Cesium 134 is water soluble monovalent alkalai metal (which mitigates against bio-accumulation), and only has a half life of 2 years. Iodine 131 has a half life of 8 days. Bio-accumulation is a ridiculous scare story with these isotopes. Yes, but of a considerably greater concern than that posed by the “global warming” release. Half Life of 8 days. Earthquake happened in 2011. That’s a whole lot of halfing. Still we started with J’s Billions of Becquerels. … so just what is a Becquerel when it’s being stored in a Mason jar? Can we get a conversion? And would that be a mililitter thing or a ‘banana equivalent’ thing? OK, so those are not the worst (unless you are close to Japan). Cesium-137 has a half-life of 30 years. Strontium 90 levels are 100X clean sea water, and it also has a long half life. And a few billion Bq of plutonium isotopes, and other assorted goodies. Just saying, a few inert fluorocarbons are minor compared to the radioactive stuff. Tonight you can enjoy your first really good night’s sleep in years! Or they could you it to control a new uranium fueled power station. There was obviously a very large and un-reported release of N2O that didn’t make it into this release. But the heat isn’t quantified, so I have to assume that normally Japan’s emissions of those gasses cause 100 joules of heat to be trapped in the atmosphere but in the critical period 136 joules were trapped. Their language becomes more and more detached. No wonder people stop paying attention. Global warming will collapse like the Tower of Babel. There was a time when it wasn’t embarrassing to be a geophysicist. Why would insulation ‘give up the gas’ after the quake? Is the point that water is the agent? The earthquake also caused ~16,000 deaths. But that’s not important. A tiny amount of gas causing a far greater effect in a computer model is. It is pretty surreal but I’d bet that there would have been plenty of Japanese exclamations to the effect of “Oh no! There goes my favourite Sushi restaurant”. Truth is thousands die in anguish everyday and we still live for our latte. breaks my heart. The Climate Nazistas have really taken hold of people’s grasp on reality. I remember. The end of an age of reason is inevitable and ugly, it would seem. This article was amended on 19 August 2011. The subhead said the report was “for Nasa”. This has been corrected. As a long-time AGU member, I can attest to the simple fact that AGU has become a laughingstock of a so-called scientific organization. It embarrasses me to admit that I am a member. How are you feeling these days about the Journal of Geophysical Research (JGR)? The “funny thing” is that the AAPG was ridiculed for awarding a literary award to Michael Crichton. human CO2 —> Earthquakes —> Global warming. Since this is NH winter time data, expect to see lots of CO2 NH natural Source emissions. The real carrot is what and where the sinks kick in the summer June, July August, that comes close to offsetting the NH fall-winter-Spring rise. I’m sure the EPA in the US will find a way to use this study to ban/tax or regulate something as they like this type of SciFiance. The AGU is becoming indistinguishable from the political lobbying group, the Union of Concerned Scientists. FYI, “minuscule” is spelled with a “u,” as in “minus.” I used to write it as “miniscule,” too, until someone corrected me. Just passing the favor along!